This is now in a convenient Spray top bottle. This recipe is proven, by Penny and Al in the deep woods of Minnesota to repel all those nasty mosquitos and other flying bugs. We have used this formula for several years when we are out in the woods, camping, hiking and fishing. Simply Spray a small amount to the areas of exposed skin and rub on gently. Don't forget you can use a small amount on your hands rub them together and then pat your hair to keep the pests away from your head. The bugs will leave you alone! It's a wonderful repellent for me, but is it safe for dogs ?? Thanks !! Penny adds this note: We don't suggest spraying this on dogs. But you can put a little on a handkerchief and tie that to your dog neck. Monitor the dog for any signs they do not like it and remove as soon as you are indoors again. I just got my Bug Off on Friday - the mosquitoes are horrendous around here. Tonight I sprayed some Bug Off on and the mosquitoes left me alone. I could be a spokesperson for this!!!! Love it - it is going in my golf bag! Thank you!!! I'm a Mosquito MAGNET. People Invite me on outdoor excursions so they don't get bit - because all those critters shun normal people when my blood is there to be sucked. 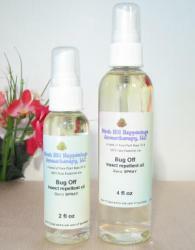 I made about 25 different essential oil insect repellent blends, in solutions of from 2% to 25% .. but NOTHING worked. I finally decided I simply had to use Deet. Yuck! HOWEVER ... Then I found Penny’s Bug-Off, and IT WORKS!!! I reapply it every 2 hours, and it's a sure-fire mosquito repellent. True, I still use Deet ("Off", or similar) in deep woods with water around, especially toward dusk. But otherwise, Bug-Off is the solution!